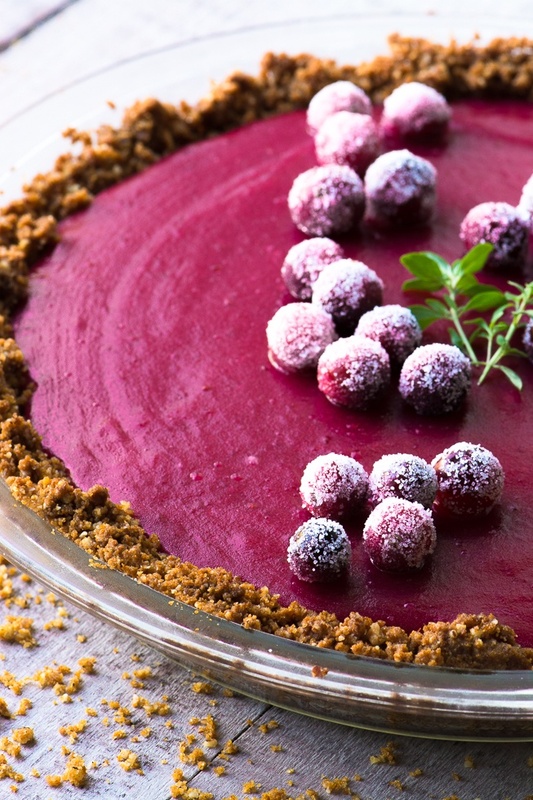 This Cranberry Pie with its spicy gingersnap crumb crust and silky cranberry curd filling brings a little va-va-voom to the traditional dessert table! Put the gingersnaps in a food processor and process until they are fine crumbs. (this should be a heaping cup) Add the walnuts, and sugar and process again until everything is finely ground. Add the butter and process briefly to combine. Pat the crust into a 9 inch pie plate, and up the sides. Bake for 10-12 minutes. Set aside to cool. Put the cranberries, 1 cup of the sugar, and 1/4 cup water to a simmer in a saucepan. Lower the heat and simmer the cranberries, uncovered, for about 15 minutes until they've popped and the mixture is quite thick. Let cool slightly and then puree until completely smooth. Whisk the puree, the eggs, yolks, salt, lemon juice and 1/2 cup sugar together in a saucepan and set over medium heat. Cook, stirring constantly, until the mixture thickens and coats the back of a spoon, this will take about 10 minutes or so. Stay by the pan the whole time and stir! Push the curd through a mesh strainer, using the back of a spoon to get it all through. Let the curd cool for a few minutes and then drop the room temperature butter in, bit by bit, while you stir to melt it. Pour the curd into the pie crust and smooth out evenly. Chill the pie until it is firm, about 2 hours or so. Decorate with sugared cranberries if you like. To make sugared cranberries, roll damp cranberries in granulated sugar and let dry.